How Dangerous is Being Sedentary to Your Health? suffered 82% more cardiovascular deaths. need to walk 2 miles a day to be considered active. walking 10,000 steps a day to your health. matter, as long as you get in your 10,000 steps a day. lowers blood sugar in diabetics. refrigerator to the couch and back. 30% of us are technically obese. lifespan with just a little bit of effort? your overall chances of dying from all causes by 14%. benefit the more you put in. some extra steps a day to become more active? muscle mass, which in turn speeds up your metabolism. You then burn calories 24 hours a day, even as you sleep. 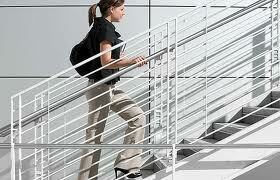 second week, increase that to 100 stair steps a day. you cross your legs to add more fidgeting to your day. stand up and sit down again, you have done a squat. during lunch, if you work at it. shower in the mornings. Or at night before you go to bed. them out the door add a few steps and work your arms. park can add valuable steps to your day and your week. count their steps, walk more. count your 10,000 steps a day. It may just save your life. long-living healthy cultures around the world. Stay hearty. maintain your balance, you must keep moving." Most people don't know that being sedentary makes you more susceptible to heart problems. How many total hours a week do you ride in cars and watch TV?